I now have friends from all over the world! 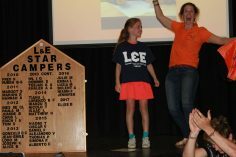 With the sun shining and bird song in the air, the outlook seemed bright for the commencement of L&E North camp 2017. The tutors arrived at camp, some seasoned and some new, excited to have the children return. As the happy campers arrived through the afternoon in their dribs and drabs, the tutors where put through their paces scaling 4 stories with some of the heaviest bags known to man. Thankfully, camper Alice was kind enough to remove her weights before allowing her bags to be carried. The campers enjoyed unpacking their belongings whilst chatting to new and old friends. The quiet school was now bustling with the noises of happy children. With the sun shining, the campers were treated to beautiful barbecue and the parents bid their goodbyes. All were content and fed and it was time for some games. Old classics such as fruit basket, 40/40 and duck, duck, goose where brought back, as well as a new introduction of Zap which seemed to have been well received. As the day drew to a close, the campers had the chance to slow things down by enjoying a hot chocolate and chatting away like long lost friends. 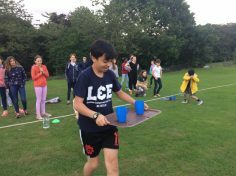 With only one spillage, the future of L&E north camp is looking bright. Till tomorrow, sleep tight campers and be ready for an action packed day of fun. once everyone was warmed up we picked our activities for the day. The English team spent the morning getting to know one another, writing an L&E rap and playing lots of games. Other children were getting creative with the tutors’ faces (not their actual faces, fortunately) and making inspirational depictions of what is going on in their own heads. The sporting contingent had a varied morning of hockey, cricket and football, whilst the adventurers learned some key life saving skills in the pool. After a delicious lunch of meatballs and pasta the campers were ready for a fun-filled afternoon, and, surprise surprise, the sun poked its head out! The horse riders set out to meet their steeds, spending a lovely afternoon at the stables. Back at base camp the keen footballers got to hone their skills while the other sportsmen and women played quick cricket, with Camille showing the boys who’s boss. The creative kids got down to making some jewellery – bracelets and loom band creations aplenty! The first evening swim was a popular affair and a hearty dinner followed. Then, the moment the campers had been eagerly awaiting… Icebreaker games! Tutors Ollie, Sophie and Sam organised an exciting array of goofy games including pass the water bucket, apple bobbing, toss the egg and tug of war. Safe to say our campers were worn out (and some a bit wet and eggy) and ready for a warm shower, hot chocolate and bed. All in all, a wonderful ‘official’ first day of camp! New friendships forming everywhere we look and smiles all around. Let’s see what the rest of the week has in store! It was a cloudy, crisp morning but we warmed up quickly with an energetic match of dodge ball; the perfect way to shake away the morning cobwebs! This healthy competition was maintained throughout the day, with the English Team facilitating an action-packed morning complete with hangman, pictionary, and splat runoffs which engaged the students in vocabulary recall. Meanwhile, the kids partaking in sports started their day with bench ball and ultimate frisbee. Today’s adventure component was dedicated to scuba diving, which proved both hugely popular and successful with the campers. Beware mums and dads, you may be asked to take your children on some beach side holidays in the near future! 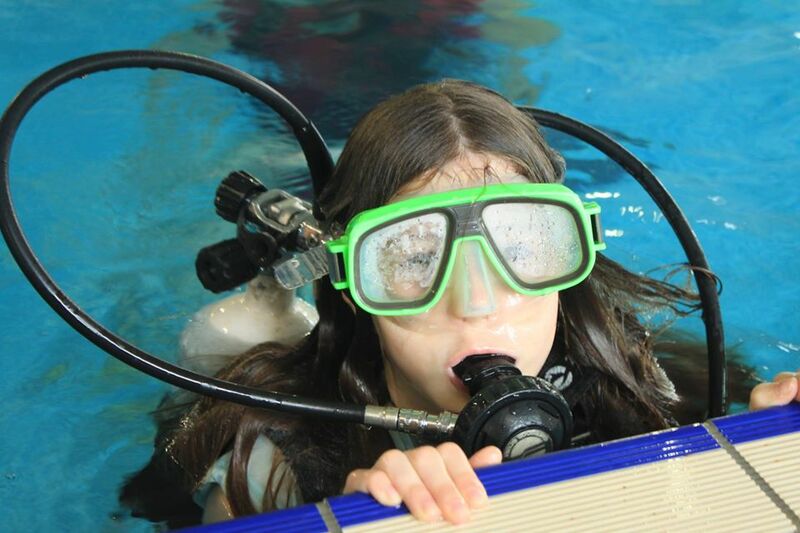 We must acknowledge Camille’s astounding achievement in her scuba class this morning. 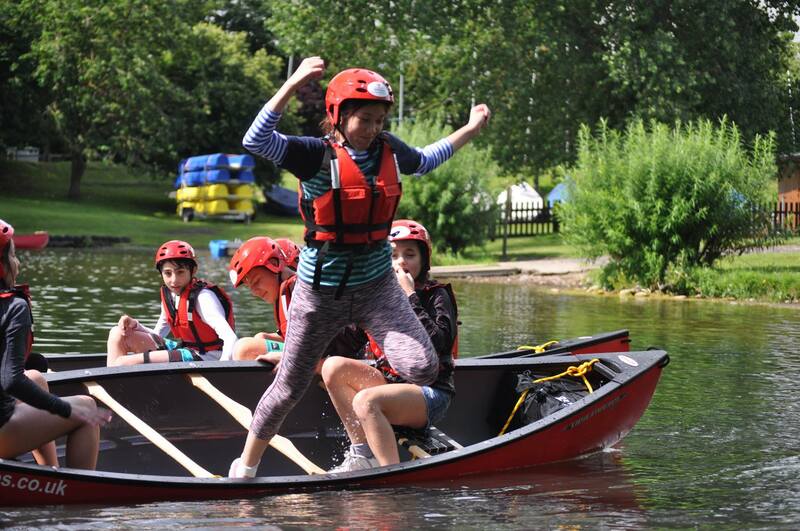 After some reluctance, she overcame her fear of water and participated fully in the course. We are all incredibly proud of her! The creative session commenced with papier mache, followed by choreographed dance lead by our very own dance and movement specialist, Hayley. We recorded these dances into a succinct film and concluded the morning with a meditation session. Lots and lots of fun were had by all! As expected, the evening swimming session was a highlight with our campers (a few stray water balloons might have found their way into the gym – we always ensure L&E have a special edge!). The drizzly weather prevented a campfire but the tuckered out children were more than happy with the alternative of snuggling into the Library for a thrilling screening of Star Wars in anticipation of our theme night later this week! 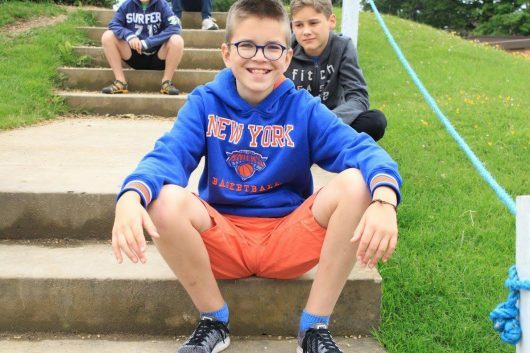 Another wonderful day has concluded with our weary campers climbing into bed with smiles on their faces, full of excitement for the events tomorrow will bring! This morning we were treated to a clear blue sky, which the kids were happy to see after two rainy days! 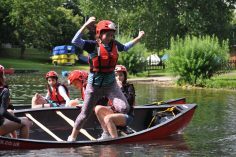 We took advantage of the weather and after a filling breakfast half the group set of to Canoe in some of Yorkshires’ most spectacular lakes and rivers. The other half of camp stayed for camp dodgeball before splitting up into different activities. This included a chance to research some English recipes, which the kids then cooked in English. Everyone enjoyed the lovely cookies and English Muffins they made! 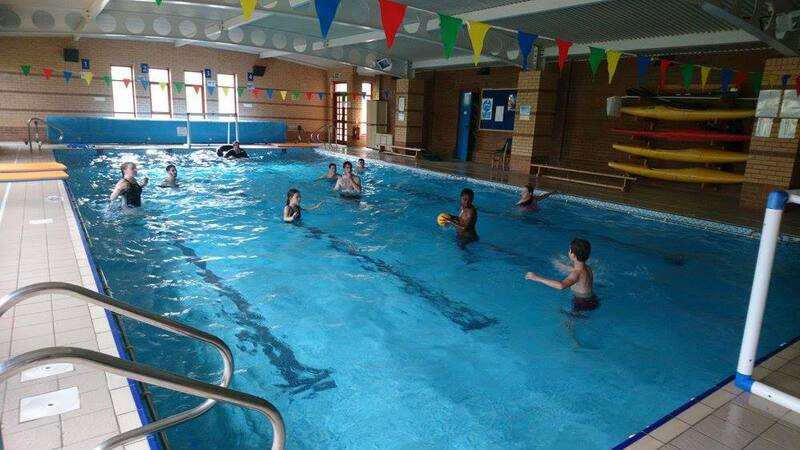 Elsewhere the kids were creating hot air balloons in their creative session with some wonderful designs, whilst the other children enjoyed a game of water polo in the pool. That took us up to lunch which was enjoyed by all and gave everyone the fuel needed to enjoy the afternoon. Another group of kids went off to Kayak in the afternoon sun whilst those who stayed at camp were given a great selection of activities. This included football, where the boys continued to make progress in L&E’s football school, rapping, which was taken by our resident French tutor Baptiste who showed the kids some french free-flow rapping. Elsewhere the children enjoyed a treasure hunt on the school grounds in which everyone searched for the hidden clues around the camp. After a quick watertight and swim, which allowed everyone to cool off from the afternoon heat, we gathered for dinner. After dinner was our famous campfire night. 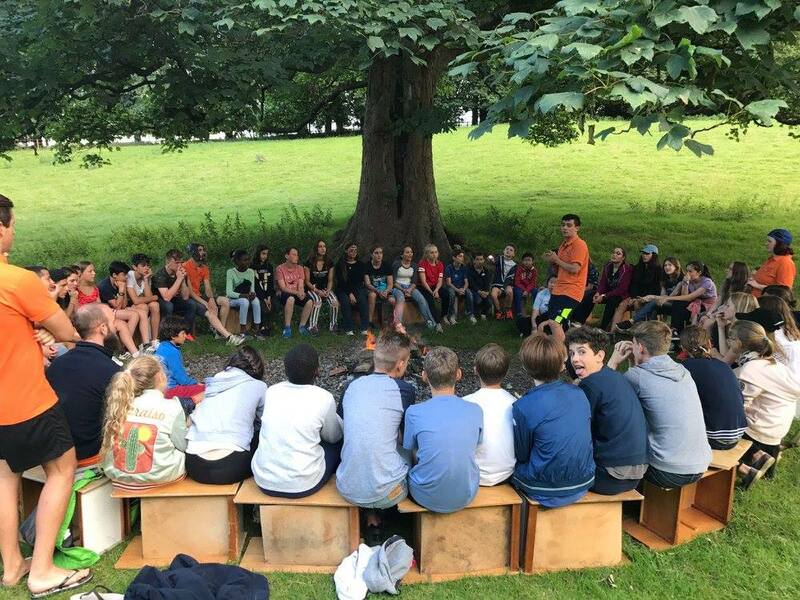 After a quick camp of giants, wizards, dwarfs, a game that’s are still a mystery to all involved, we headed down to a great fire which had been prepared by our camp tutors. 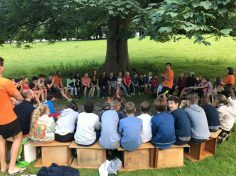 It was a great evening in which everyone was involved, singing songs together and playing campfire games. The children were given the chance to perform songs from their different countries and it was lovely to see the diversity of languages and cultures on show, which is a unique feature of the camp and one that everyone embraces ad L&E. After singing their hearts out through the evening the kids were ready to head back in for hot chocolate. They then headed up stairs and had a little time to chat with their tutors and each other before getting ready for lights out. It was a wonderful day and were hoping for more of the same through the rest of the week. We were once again blessed with splendid weather – which was fantastic given that we had an adventure line up of rock climbing which could thus proceed as planned (to the delight of our happy campers!). 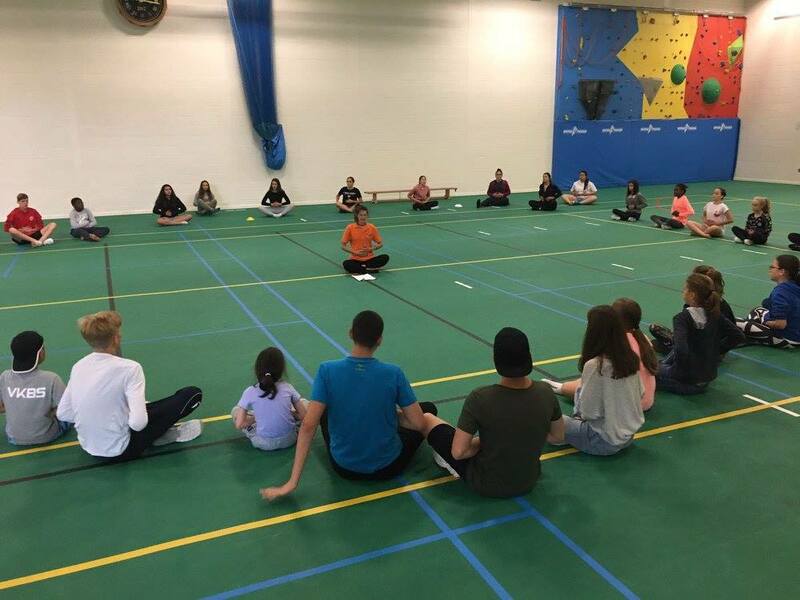 Our first group of climbers headed to Downholm, situated on the edge of the Yorkshire Dale National Park after a hearty breakfast, while the rest of the group headed to the gym for a therapeutic yoga session followed by (of course) L&E’s famous dodgeball warmup. 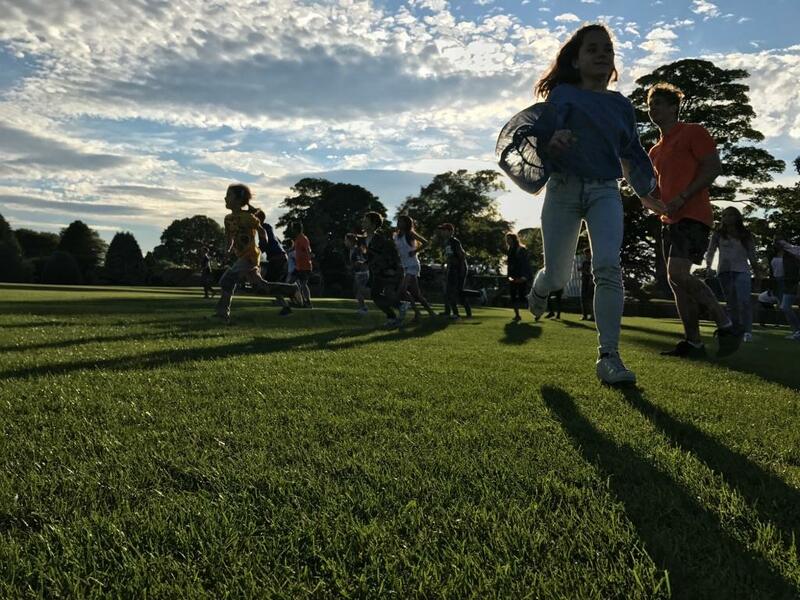 Morning activities based at Aysgarth consisted of rounders and ultimate frisbee sessions running parallel to cookie baking which didn’t seem to make too great a dent in the kids’ appetites at lunch! The kitchen always provides a spectacular salad bar alongside their lunchtime meals, which we are impressed to relay that the kids love – well done parents for instilling such healthy habits in your kids. We are very impressed! The afternoon saw a second group of campers heading out to Downholm, as well as our horse riders off to the stables. Soccer camp got under way and the remaining campers chose between fire making skills – I believe that many kids can now start a campfire with nothing but a flint, and creative. Our creative session was quite diverse, including chalk art in the carpark, marble art prints, an expressive creative walk around the school grounds and, Star Wars themed “Galaxy in a Bottle” creations in preparation for our theme evening which kicked off after supper. The day ended with hot chocolate and marshmallows. Our tuckered out campers are now tightly tucked up in bed getting some much needed rest before another jam packed day tomorrow. The weather looked promising heading out for warm up dodgeball and we added a side of cheerleading and dance to get everyone ready for another busy day at camp. With such nice weather, all tutors took their activities outside spreading across the fantastic Aysgarth campus and beyond. 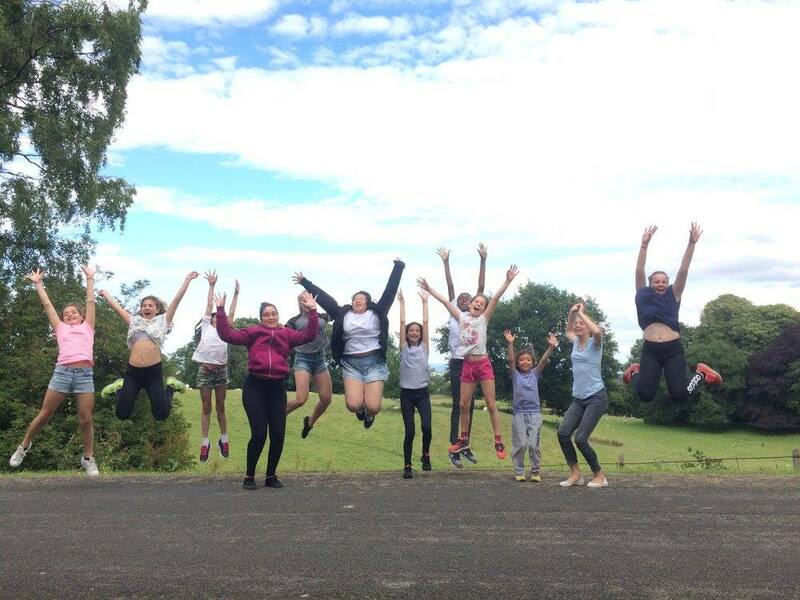 The English class ventured into nearby town, Bedale to test out their vocabulary learn about some important British staples and experience Yorkshire life outside camp. The creative session took inspiration from Native American tradition, foraging for natural resources and taking them back to our outdoor workshop to make dream catchers while listening to traditional stories and music. The adventure session were also exploring the forest for bushcrafts round the campfire and in sport, the kids got a taste of touch rugby Nerf ball, American football and Waterpolo before we all came together for a delicious lunch of fish and chips. After some free time with new camp friends everyone came back together for the L&E triathlon: swim, obstacle course and run (including dress up, of course). 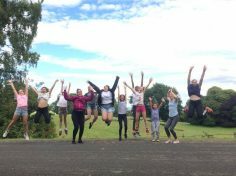 With great team work, and a few individuals taking on the full course, we celebrated with lots of fun on the waterslide and everyone getting thoroughly soaked. For the evening we got into our finest for the Oscars, to announce all this week’s winners including the ‘Be Kind, Be Kind, Be Kind’ and Star Camper awards. The kids were tucked up after some hot chocolate and chats, ready to start tomorrow with some goodbyes and a trip to York. For those of you didn’t know L&E do offer tours/school trips and family holidays outside the main holidays so please be in contact if you want to find out more. Filed Under News · Comments Off on L&E All Year Round! 2012 has been an amazing year for L&E. We are able to look back with fond memories of all the events and camps we’ve hosted. The feedback has been wonderful and we appreciate everything that has been said. It is really reassuring to hear that we are doing something right! Over 70% return rate this summer really proved it! The 2013 Easter & Summer Dates have been confirmed for a while. We have places still left but nearly half of all places are already booked for summer 2013. Please be in contact with us soon to avoid disappointment. 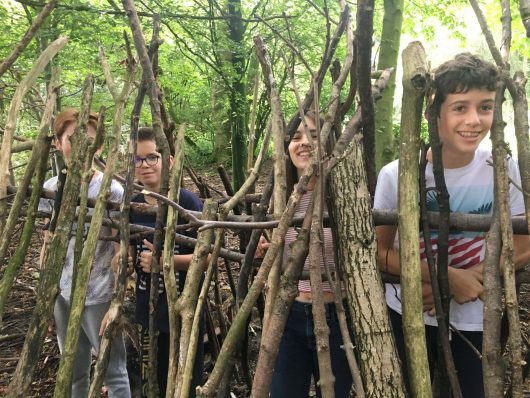 In the past we have asked children to choose which course they want before the camps start but due to popular demand this year at our Easter & Summer Camps we will be offering the “L&E EXPERIENCE” as our standard activity course. 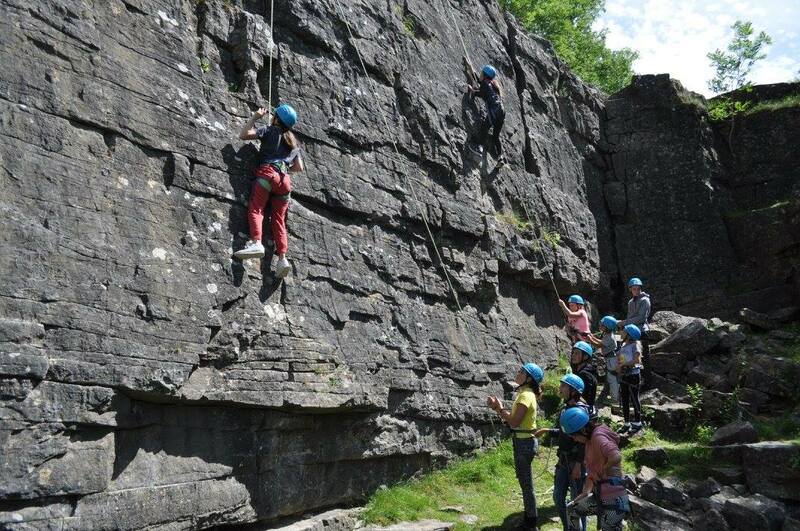 This means that each session there will be an ADVENTURE, CREATIVE & SPORT choice. 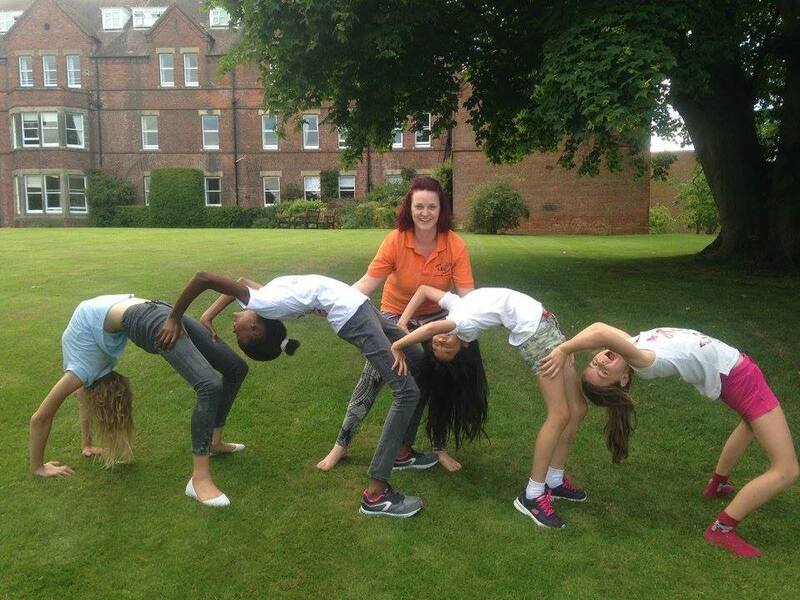 Therefore, all children will have an opportunity to try so many different activities during their time with us. numbers. Please be in contact for further information. outside of these dates. Please be in contact for further information. who are able to bring with them their own horse! Filed Under News · Comments Off on Happy New Year!